[S183] The Rev. Fr. Silas Emmett Lucas, Jr., ed., comp., & pub., The Powell Families of Virginia and the South; Being an Encyclopedia of the Eight (8) Major Powell Families of Virginia and the South in General (Vidalia, Ga.: The Rev. Silas Emmett Lucas, Jr., 1969) ("printed under the Auspices of Georgia Genealogical Reprints"), p. 413 (naming Honorias Powell, Jr. as his father). [S183] The Rev. Fr. Silas Emmett Lucas, Jr., The Powell Families of Virginia and the South, above, p. 413 (indicating that Jeanette _____ was his mother). [S183] The Rev. Fr. Silas Emmett Lucas, Jr., The Powell Families of Virginia and the South, above, p. 413. [S183] The Rev. Fr. Silas Emmett Lucas, Jr., ed., comp., & pub., The Powell Families of Virginia and the South; Being an Encyclopedia of the Eight (8) Major Powell Families of Virginia and the South in General (Vidalia, Ga.: The Rev. Silas Emmett Lucas, Jr., 1969) ("printed under the Auspices of Georgia Genealogical Reprints"), p. 413 (naming Honorias Powell, Jr. as her father). [S183] The Rev. Fr. Silas Emmett Lucas, Jr., The Powell Families of Virginia and the South, above, p. 413 (indicating that Jeanette _____ was her mother). [S183] The Rev. Fr. Silas Emmett Lucas, Jr., The Powell Families of Virginia and the South, above, p. 413 (Francis Kirtley named as husband of Eliza Kirtley, and Eliza named as sister of Simon Powell, in Simon's 3 Jan 1771 will, citing to Will Book 2, 1744-1778, Orange County, Va.). [S183] The Rev. Fr. Silas Emmett Lucas, Jr., The Powell Families of Virginia and the South, above, p. 413 (naming Eliza Powell as his mother). [S183] The Rev. Fr. Silas Emmett Lucas, Jr., ed., comp., & pub., The Powell Families of Virginia and the South; Being an Encyclopedia of the Eight (8) Major Powell Families of Virginia and the South in General (Vidalia, Ga.: The Rev. Silas Emmett Lucas, Jr., 1969) ("printed under the Auspices of Georgia Genealogical Reprints"), p. 413 (Francis Kirtley named as husband of Eliza Kirtley, and Eliza named as sister of Simon Powell, in Simon's 3 Jan 1771 will, citing to Will Book 2, 1744-1778, Orange County, Va.). [S183] The Rev. Fr. Silas Emmett Lucas, Jr., The Powell Families of Virginia and the South, above, p. 413 (indicating that Francis was his father). [S183] The Rev. Fr. Silas Emmett Lucas, Jr., ed., comp., & pub., The Powell Families of Virginia and the South; Being an Encyclopedia of the Eight (8) Major Powell Families of Virginia and the South in General (Vidalia, Ga.: The Rev. Silas Emmett Lucas, Jr., 1969) ("printed under the Auspices of Georgia Genealogical Reprints"), p. 413 (indicating that Francis was his father). [S183] The Rev. Fr. Silas Emmett Lucas, Jr., ed., comp., & pub., The Powell Families of Virginia and the South; Being an Encyclopedia of the Eight (8) Major Powell Families of Virginia and the South in General (Vidalia, Ga.: The Rev. Silas Emmett Lucas, Jr., 1969) ("printed under the Auspices of Georgia Genealogical Reprints"), pp. 413, 419 (naming Honorias Powell, Jr. as her father). [S183] The Rev. Fr. Silas Emmett Lucas, Jr., The Powell Families of Virginia and the South, above, pp. 413 (indicating that Jeanette _____ was her mother), 419 (naming Jeanette _____ as her mother). [S183] The Rev. Fr. Silas Emmett Lucas, Jr., The Powell Families of Virginia and the South, above, p. 419. [S183] The Rev. Fr. Silas Emmett Lucas, Jr., The Powell Families of Virginia and the South, above, p. 420 (naming Joyce Powell as her mother). [S183] The Rev. Fr. Silas Emmett Lucas, Jr., The Powell Families of Virginia and the South, above, p. 419 (naming Joyce Powell as his mother). [S183] The Rev. Fr. Silas Emmett Lucas, Jr., The Powell Families of Virginia and the South, above, p. 419 (naming Joyce Powell as her mother). [S183] The Rev. Fr. Silas Emmett Lucas, Jr., ed., comp., & pub., The Powell Families of Virginia and the South; Being an Encyclopedia of the Eight (8) Major Powell Families of Virginia and the South in General (Vidalia, Ga.: The Rev. Silas Emmett Lucas, Jr., 1969) ("printed under the Auspices of Georgia Genealogical Reprints"), pp. 413 (Salley Powell named as child of Simon Powell in his 3 Jan 1771 will, citing to Will Book 2, 1744-1778, Orange County, Va.), 419 (giving her name as Sally Powell and naming Simon Powell as her father. [S183] The Rev. Fr. Silas Emmett Lucas, Jr., The Powell Families of Virginia and the South, above, p. 419 (indicating that Martha _____ was her mother). [S27] John Wright Boyd, A Family History: Lt. Thomas Fortson (1742-1824) and Some of His Descendants—Early Settler of Elbert County, Georgia (Danielsville, Ga.: Heritage Papers, 1973), p. 10. [S190] Navarro County Cemetery Records, vol. 10 (Corsicana, Tex. : The Navarro County Gen. Soc'y, 1990), p. 58. [S312] Social Security Death Index, online at http://tinyurl.com/AncestrySSDI, viewed on 27 Mar 1998. [S31] Navarro Leaves and Branches, vol. XV, no. II (May 1992), p. 3 (citing Navarro County, Tex. Marriage Records, bk. XIV, p. 7). [S312] Social Security Death Index, online at http://tinyurl.com/AncestrySSDI, viewed on 27 Mar 1998 (stating that she died in Jan 1980; not naming the place of death but stating that she lived in Corsicana, Texas when she died and that last benefits were sent to an address in Corsicana, Texas). [S190] Navarro County Cemetery Records, vol. 10, above, p. 58 (spelling her surname as Monfort) (common stone with W. Frank Montfort). Marriage*: He married Mary _____. [S190] Navarro County Cemetery Records, vol. 10 (Corsicana, Tex. : The Navarro County Gen. Soc'y, 1990), p. 111 (naming John Justiss as his father). Marriage*: She married John Justiss. [S190] Navarro County Cemetery Records, vol. 10 (Corsicana, Tex. : The Navarro County Gen. Soc'y, 1990), p. 111 (naming Mary Justiss as her mother). [S189] Navarro County Cemetery Records, vol. 9 (Corsicana, Tex. : The Navarro County Gen. Soc'y, 1989), p. 3 (naming Geo. F. Markgraff as his father). [S961] Find A Grave, online at http://www.findagrave.com, memorial for Frederick McKamy Markgraff, memorial no. 43773985, viewed on 11 Feb 2013 (naming Geo. F. Markgraff as his father). [S189] Navarro County Cemetery Records, vol. 9, above, p. 3 (naming Beatrice Markgraff as his mother). [S961] Find A Grave, online, above, memorial for Frederick McKamy Markgraff, memorial no. 43773985, viewed on 11 Feb 2013 (naming Beatrice Markgraff as his mother). [S189] Navarro County Cemetery Records, vol. 9, above, p. 3. [S961] Find A Grave, online, above, memorial for Frederick McKamy Markgraff, memorial no. 43773985, viewed on 11 Feb 2013. Other Names*: Clinton William Frost, William Clinton Frost, Clinton Frost, Billy Frost. "Funeral services for Clinton Winkler (Billy) Frost, aged 33 years, who died in the P. & S. Hospital, San Antonio, Tuesday morning at 9 o’clock, were held Thursday morning at 10 o’clock from the residence of Mr. and Mrs. A. N. Justiss, 629 West Third avenue with interment in Oakwood cemetery. The services were conducted by Rev. F. P. Culver, pastor of the First Methodist church. "The body arrived in Corsicana from San Antonio early Wednesday morning. "Mr. Frost was a veteran of the World War. He went overseas with the Ninetieth Division and served under General Henry T. Allen. After the armistice was signed, he served with the Army of Occupation in Germany. "Surviving are two brothers, Roger and Barry Frost, both of Corsicana; six sisters, Mrs. A. N. Justiss, Mrs. George E. Jester, Mrs. Max D. Almond, Mrs. Guy M. Gibson, Mrs. R. L. Calkins, all of Corsicana, and Mrs. A. D. Kneale of Tulsa, Okla. Note*: • He never married. • He served in Europe with the Ninetieth Division in World War I and in the Army of Occupation in Germany after the armistice. [S298] Wyvonne Putman, "Judge Samuel Romulus Frost," in Navarro County Scroll 1988 (Corsicana, Tex. : The Navarro County Hist. Soc'y, 1967), pp. 10-18, p. 18 (naming Samuel Romulus Frost as his father). [S1115] Edward Lynn Williams, electronic mail to Roger Bartlett, 9 Nov 1998 (naming Samuel Romulus Frost as his father). [S1115] Edward Lynn Williams, electronic mail to Roger Bartlett, 9 Nov 1998 (naming Mary Louise ['Mollie'] Winkler as his mother). [S1115] Edward Lynn Williams, electronic mail to Roger Bartlett, 9 Nov 1998. [S961] Find A Grave, online at http://www.findagrave.com, memorial for Clinton William Frost, memorial no. 53653210, viewed on 24 Feb 2014. [S189] Navarro County Cemetery Records, vol. 9, above, p. 112 (giving the year but not the place or other date information). [S11] Index to Texas Death Records (Austin, Tex. : Tex. Dept. of Health, Bur. of Vital Statistics), typescript, 1903-40, vol. 17, p. 8334, file 29390 (giving his name as C. W. Frost and giving the date and county but no other information). [S1115] Edward Lynn Williams, electronic mail to Roger Bartlett, 9 Nov 1998 (giving the date and county but no other information). [S1207] Corsicana Daily Sun, Corsicana, Tex., online archive at http://corsicana.newspaperarchive.com, 29 Sep 1927, p. 4, col. 2 (obituary of Clinton Winkler Frost). [S961] Find A Grave, online, above, memorial for Clinton William Frost, memorial no. 53653210, viewed on 24 Feb 2014 (giving the year but no other information). [S189] Navarro County Cemetery Records, vol. 9, above, p. 112 (giving the cemetery but not the date). [S961] Find A Grave, online, above, memorial for Clinton William Frost, memorial no. 53653210, viewed on 24 Feb 2014 (not giving the date). [S1207] Corsicana Daily Sun, Corsicana, Tex., online archive, above, 29 Sep 1927, p. 4, col. 2 (reprinted here with consent of the Corsicana Daily Sun, with obvious typographical errors corrected). [S391] Mattie Mae Ellis, Rice, Tex., letter to Roger Bartlett, 6 Jan 1977 (attributing information to Sue Burnett) (first bullet). [S1207] Corsicana Daily Sun, Corsicana, Tex., online archive, above, 29 Sep 1927, p. 4, col. 2 (obituary of Clinton Winkler Frost) (second and third bullets). [S189] Navarro County Cemetery Records, vol. 9 (Corsicana, Tex. : The Navarro County Gen. Soc'y, 1989), p. 112 (naming W. W. Frost as his father). [S1115] Edward Lynn Williams, electronic mail to Roger Bartlett, 9 Nov 1998 (naming William W. Frost as his father). [S189] Navarro County Cemetery Records, vol. 9, above, p. 112 (naming L. M. Frost as his mother). [S1115] Edward Lynn Williams, electronic mail to Roger Bartlett, 9 Nov 1998 (naming Mary Louisa Brewer as his mother). [S1115] Edward Lynn Williams, electronic mail to Roger Bartlett, 9 Nov 1998 (stating that he probably died in Navarro County, Texas). [S189] Navarro County Cemetery Records, vol. 9, above, p. 112 (identifying him as "son of W. W. & L. M. Frost"). Other Names*: Addie Callaway McConnico, Addie McConnico. [S961] Find A Grave, online at http://www.findagrave.com, memorial for Addie Ophilia Callaway McConnico, memorial no. 98020899, viewed on 8 Feb 2013 (naming Rockhill C. Callaway as her father). [S961] Find A Grave, online, above, memorial for Rockhill C. Callaway, memorial no. 98131398, viewed on 8 Feb 2013 (naming Rockhill C. Callaway as her father). [S189] Navarro County Cemetery Records, vol. 9 (Corsicana, Tex. : The Navarro County Gen. Soc'y, 1989), p. 101 (giving the date but not the place). [S961] Find A Grave, online, above, memorial for Addie Ophilia Callaway McConnico, memorial no. 98020899, viewed on 8 Feb 2013. [S189] Navarro County Cemetery Records, vol. 9, above, p. 101. [S961] Find A Grave, online, above, memorial for James Washington McConnico, memorial no. 10368374, viewed on 8 Feb 2013. [S204] Records of Bank Sutherland Funeral Home (later McCammon Funeral Home), Corsicana, Texas, in Navarro Leaves and Branches, vol. IV, no. 2 (May 1981), p. 31. [S961] Find A Grave, online, above, memorial for Roscoe McConnico, memorial no. 64926029, viewed on 8 Feb 2013 (naming Addie Ophilia Callaway as his mother). [S961] Find A Grave, online, above, memorial for Hester McConnico, memorial no. 98133471, viewed on 7 Apr 2017 (naming Addie Ophilia Callaway McConnico as his mother). [S242] Joe Guthrie, Corsicana, Tex., undated biography of Joseph Alvey Clayton, given to Roger Bartlett by Joe Guthrie 31 May 1973, p. 3 (naming Joseph Halbert Clayton as his father). [S242] Joe Guthrie, biography Joseph Alvey Clayton, above, p. 3 (naming Annie May Lisman as his mother). [S189] Navarro County Cemetery Records, vol. 9 (Corsicana, Tex. : The Navarro County Gen. Soc'y, 1989), p. 69. [S11] Index to Texas Death Records (Austin, Tex. : Tex. Dept. of Health, Bur. of Vital Statistics), typescript, 1917, p. 4728, file 19650. [S189] Navarro County Cemetery Records, vol. 9, above, p. 69 (giving his name as Frank Clayton). [S242] Joe Guthrie, biography Joseph Alvey Clayton, above, p. 3. [S137] Index to Texas Delayed Probate Birth Records (Austin, Tex. : Tex. Dept. of Health, Bur. of Vital Statistics), vol. 24, p. 11749, file 360568. [S189] Navarro County Cemetery Records, vol. 9 (Corsicana, Tex. : The Navarro County Gen. Soc'y, 1989), p. 35 (giving his middle name as Melton and giving the date only). [S312] Social Security Death Index, online at http://tinyurl.com/AncestrySSDI, viewed on 20 Mar 1998 (giving only the date). [S11] Index to Texas Death Records (Austin, Tex. : Tex. Dept. of Health, Bur. of Vital Statistics), typescript, 1981 (microfiche), p. 1174, file 64507-81. [S312] Social Security Death Index, online at http://tinyurl.com/AncestrySSDI, viewed on 20 Mar 1998 (stating that he died in Jul 1981; not naming the place of death but stating that he lived in Houston, Texas when he died). [S189] Navarro County Cemetery Records, vol. 9, above, p. 35 (giving his name as Melton). [S189] Navarro County Cemetery Records, vol. 9, above, p. 35 (naming L. N. Matthews as her father). [S58] Index to Texas Birth Records (Austin, Tex. : Tex. Dept. of Health, Bur. of Vital Statistics), typescript 1933, vol. 3, p. 1321, file 10945 (not giving her name but identifying her as "Infant of Lloyd Nelson Matthews"). [S189] Navarro County Cemetery Records, vol. 9 (Corsicana, Tex. : The Navarro County Gen. Soc'y, 1989), p. 35 (naming L. N. Matthews as her father). [S189] Navarro County Cemetery Records, vol. 9, above, p. 35. [S189] Navarro County Cemetery Records, vol. 9, above, p. 35 (giving only the date). [S1336] Clopton Family Association Newsletter, vol. 31, no. 2 (May 2016), p. 4 ("The Booth Family") (naming Robert Booth as his father). [S1336] Clopton Family Association Newsletter, vol. 31, no. 2 (May 2016), p. 4 ("The Booth Family") (naming Frances Booth as his mother). Marriage*: He married Elizabeth Booth, daughter of Dr. Robert Booth and Frances _____. Marriage*: He married Joan Wallis. Marriage*: She married Patrick Napier. [S43] Marriage Records, Navarro County, Tex., vol. 1, p. 378. [S43] Marriage Records, Navarro County, Tex., vol. 1, p. 403. [S738] Ellen Nelson, chart of descendants of Susan C. Bowden and Dave Queen sent to Roger Bartlett, 11 April 2002,(naming Dave Queen as her father). [S1076] 1900 U.S. Census, Navarro County, Tex., City of Corsicana, sheet 21, line 97 (naming David Queen as her father). [S738] Ellen Nelson, chart of descendants of Susan C. Bowden and Dave Queen, above,(naming Susan C. Bowden as her mother). [S738] Ellen Nelson, chart of descendants of Susan C. Bowden and Dave Queen, above,(giving the date but not the place). [S312] Social Security Death Index, online at http://tinyurl.com/AncestrySSDI, viewed on 30 May 2006 (giving the date but not the place). [S1076] 1900 U.S. Census, Navarro County, Tex., City of Corsicana, sheet 21, line 97 (stating that she was born in November 1886 in Texas). [S961] Find A Grave, online at http://www.findagrave.com, memorial for Carrie Ruth Jones, memorial no. 76893762, viewed on 25 Nov 2012 (giving the date but not the place). [S18] Rice Rustler, Rice, Tex., 23 Nov 1906, p. 1, col. 3 (stating that they had recently married without giving the date or place). [S738] Ellen Nelson, chart of descendants of Susan C. Bowden and Dave Queen, above,(not giving the date or place). [S31] Navarro Leaves and Branches, vol. 29, no. 3 (Aug 2006), p. 14 (citing Navarro County, Tex. Marriage Records, bk. XVI, p. 275). [S312] Social Security Death Index, online at http://tinyurl.com/AncestrySSDI, viewed on 30 May 2006 (stating that she died in Aug 1981; not giving the place of death but stating that she lived in Nacogdoches, Texas when she died). [S961] Find A Grave, online, above, memorial for Carrie Ruth Jones, memorial no. 76893762, viewed on 25 Nov 2012. [S18] Rice Rustler, Rice, Tex., 24 March 1905. [S738] Ellen Nelson, chart of descendants of Susan C. Bowden and Dave Queen, above,(naming Carrie Ruth Queen as her mother). [S961] Find A Grave, online at http://www.findagrave.com, memorial for William James Jones, memorial no. 76893658, viewed on 25 Nov 2012. [S738] Ellen Nelson, chart of descendants of Susan C. Bowden and Dave Queen, above,(naming Will James Jones as her father). [S194] Lennie D. Tisdale, "Lennie D. & Clarence Tisdale Family," in San Saba County History 1856-1983 (San Saba, Tex. : San Saba Hist. Commission, 1983), p. 326 (naming Lennie Delaine Dalton as her mother). [S137] Index to Texas Delayed Probate Birth Records (Austin, Tex. : Tex. Dept. of Health, Bur. of Vital Statistics), vol. 19, p. 9258, file 214524 (giving the date and naming the county but not the town). [S841] Obituary of Lennie D. Tisdale, online http://ftp.rootsweb.com/pub/usgenweb/tx/tomgreen/obits/1999/…, viewed on 15 Jun 2003 (citing San Angelo Standard-Times, San Angelo, Tex., 24 Feb 1999). [S194] Lennie D. Tisdale, "Lennie D. & Clarence Tisdale Family," above, p. 326. [S194] Lennie D. Tisdale, "Lennie D. & Clarence Tisdale Family," above, pp. 326-37 (giving information about his military service and their residences). [S841] Obituary of Lennie D. Tisdale, above, (giving information about clubs, church, and survivors). [S312] Social Security Death Index, online at http://tinyurl.com/AncestrySSDI, viewed on 6 Apr 1998. [S194] Lennie D. Tisdale, "Lennie D. & Clarence Tisdale Family," in San Saba County History 1856-1983 (San Saba, Tex. : San Saba Hist. Commission, 1983), p. 326. [S11] Index to Texas Death Records (Austin, Tex. : Tex. Dept. of Health, Bur. of Vital Statistics), typescript, 1995 (microfiche), p. 2262, file 65678 (giving his name as Clarence Elwood Tisdale). [S312] Social Security Death Index, online at http://tinyurl.com/AncestrySSDI, viewed on 6 Apr 1998 (not naming the place of death but stating that he lived in San Saba, Texas when he died). [S195] Lennie D. Tisdale, "John W. Dalton," in San Saba County History 1856-1983 (San Saba, Tex. : San Saba Hist. Commission, 1983), p. 70 (naming John Wesley Dalton as her father). [S195] Lennie D. Tisdale, "John W. Dalton," above, p. 70 (naming Sara Elizabeth Queen as her mother). [S195] Lennie D. Tisdale, "John W. Dalton," above, p. 70. [S195] Lennie D. Tisdale, "John W. Dalton," in San Saba County History 1856-1983 (San Saba, Tex. : San Saba Hist. Commission, 1983), p. 70 (naming John Dalton as his father). [S196] Alma Ward Hamrick, The Call of the San Saba: A History of San Saba County [Texas], 2d ed. (Austin, Tex. : San Felipe Press, Jenkins Publishing Co., 1969), p. 115 (naming John Dalton as his father) (reminiscence of John Wesley Dalton). [S195] Lennie D. Tisdale, "John W. Dalton," above, p. 70 (naming "Mrs. John Dalton" as his mother). [S196] Alma Ward Hamrick, The Call of the San Saba, above, p. 115 (naming Rebecca Naudain as his mother) (reminiscence of John Wesley Dalton). [S1] Ruth Bennett, Naudain Family of Delaware (Geneva, Neb. : n.pub., 1941), p. 85 (naming Rebecca Naudain as his mother). This material is a typescript of "notes" in Ms. Bennett's possession and apparently was originally written and compiled by James W. Lattomus. Copies are with the D.A.R. Library, Washington, D.C., and Roger Bartlett, Austin, Tex., and can be viewed at http://www.rabgenealogy.com/ui53.htm. The notes contain some inconsistencies, and page 45 was missing from the D.A.R. Library copy when it was copied. [S196] Alma Ward Hamrick, The Call of the San Saba, above, p. 113; p. 115 (misstating year as 1834) (reminiscence of John Wesley Dalton). [S196] Alma Ward Hamrick, The Call of the San Saba, above, p. 121. [S11] Index to Texas Death Records (Austin, Tex. : Tex. Dept. of Health, Bur. of Vital Statistics), typescript, 1951, vol. 1, n.p., file 4147. [S195] Lennie D. Tisdale, "John W. Dalton," above, p. 71. [S195] Lennie D. Tisdale, "John W. Dalton," above, pp. 70-71. [S195] Lennie D. Tisdale, "John W. Dalton," above, p. 70 (naming John Wesley Dalton as her father). [S195] Lennie D. Tisdale, "John W. Dalton," in San Saba County History 1856-1983 (San Saba, Tex. : San Saba Hist. Commission, 1983), p. 70 (naming J. M. Queen as her father). [S196] Alma Ward Hamrick, The Call of the San Saba: A History of San Saba County [Texas], 2d ed. (Austin, Tex. : San Felipe Press, Jenkins Publishing Co., 1969), p. 121. [S195] Lennie D. Tisdale, "John W. Dalton," in San Saba County History 1856-1983 (San Saba, Tex. : San Saba Hist. Commission, 1983), p. 70. [S11] Index to Texas Death Records (Austin, Tex. : Tex. Dept. of Health, Bur. of Vital Statistics), typescript, 1903-40, vol. 12, p. 5815, file 11268. [S197] Nancy Timmons Samuels & Barbara Roach Knox, comps., Old Northwest Texas: Historical-Statistical-Biographical, vol. 1-B, Navarro County, 1846-1860 (Ft. Worth, Tex. : Ft. Worth Gen. Soc'y, 1980), p. 573. [S198] Supposition as to mother's identity, based on believed marriage date. [S197] Nancy Timmons Samuels & Barbara Roach Knox, comps., Old Northwest Texas, vol. 1-B, above, p. 573 (not giving the place). [S297] Ronald Vern Jackson, ed., Mortality Schedule Texas 1850 (Bountiful, Utah: Accelerated Indexing Systems, Inc., 1979), p. 19. Haynie Memorial Methodist Church, Rice, Tex. [S402] Obituary of Rachel Hammonds Sessions, online http://www.rootsweb.com/~txnavarr/Obits/obituary.htm, viewed on 20 Mar 1998, (naming Rev. John Hammonds as her father). [S179] Rice Cemetery Association Directory (n.p. : n.pub., 1985) (giving only the date). This publication includes a map showing the locations of the five sections of the cemetery. The pages are not numbered. A copy is in the possession of Roger Bartlett, Austin, Tex. [S402] Obituary of Rachel Hammonds Sessions, above, (misstating the year as 1880). [S440] Navarro County Cemetery Records, vol. 4 (Corsicana, Tex. : The Navarro County Gen. Soc'y, 1985), p. 86 (spelling her name as Rachael and giving only the date). [S402] Obituary of Rachel Hammonds Sessions, above. [S440] Navarro County Cemetery Records, vol. 4, above, p. 86 (spelling her name as Rachael and stating that she was the wife of I. B. Sessions). [S440] Navarro County Cemetery Records, vol. 4, above, p. 86 (spelling her name as Rachael). [S938] A Memorial and Biographical History of Ellis County, Texas (Chicago, Ill.: Lewis Pub. Co., 1892), p. 287 (giving her name as Maud and naming Minerva Hammond as her mother), reprinted in Ellis County History (Waxahachie, Tex. : Ellis County Historical Museum & Art Gallery, Inc., 1972). [S961] Find A Grave, online at http://www.findagrave.com, memorial for Maud Sessions Gatewood, memorial no. 49033417, viewed on 25 Jun 2014 (naming Rachel Minerva Hammonds as her mother). [S197] Nancy Timmons Samuels & Barbara Roach Knox, comps., Old Northwest Texas: Historical-Statistical-Biographical, vol. 1-B, Navarro County, 1846-1860 (Ft. Worth, Tex. : Ft. Worth Gen. Soc'y, 1980), p. 510 (naming Rachel Minerva Hammonds as her mother). [S399] Obituary of Laura Sessions McGee, online at http://tinyurl.com/LauraMcGee, viewed on 19 Jul 2011, (naming Rachel Minerva Hammonds as her mother). [S938] A Memorial and Biographical History of Ellis County, Texas, above, p. 287 (naming Minerva Hammond as her mother). [S961] Find A Grave, online, above, memorial for Roxana M. Sessions Lackey, memorial no. 10367404, viewed on 24 Dec 2013 (naming Rachel Minerva Hammonds as her mother). [S938] A Memorial and Biographical History of Ellis County, Texas, above, p. 287 (naming Minerva Hammond as his mother). [S938] A Memorial and Biographical History of Ellis County, Texas, above, p. 287 (giving his name as C. M. Sessions and naming Minerva Hammond as his mother). [S262] 1850 U.S. Census, Navarro County, Texas, p. 198, dwelling 6, family 6 (indicating that she was born in Texas in 1841 or 1842). [S974] Becky Hogue, electronic mail to Roger Bartlett, 16 Jul 2004. [S481] Walter Williams, pedigree chart, 2 Jun 1999 (attributing some information to Floyd Wright). [S974] Becky Hogue, electronic mail to Roger Bartlett, 16 Jul 2004, (naming Sarah Frances Porter as his mother). [S974] Becky Hogue, electronic mail to Roger Bartlett, 16 Jul 2004, (naming Sarah Frances Porter as her mother). [S481] Walter Williams, pedigree chart, 2 Jun 1999, above (naming Sarah Frances Porter as his mother). [S961] Find A Grave, online at http://www.findagrave.com, memorial for Rufus Floyd Matthews, memorial no. 23137731, viewed on 25 Aug 2011 (naming Sarah Porter Matthews as his mother). 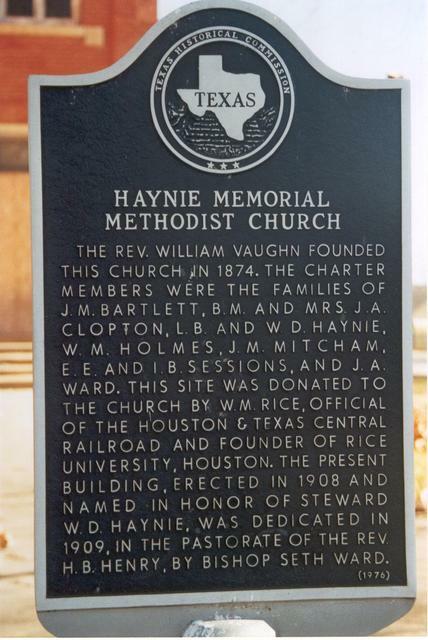 Texas state historical marker, Haynie Memorial Methodist Church, Rice, Tex., mentioning I. B. Sessions. [S938] A Memorial and Biographical History of Ellis County, Texas (Chicago, Ill.: Lewis Pub. Co., 1892), p. 287 (naming William Sessions as his father), reprinted in Ellis County History (Waxahachie, Tex. : Ellis County Historical Museum & Art Gallery, Inc., 1972). [S1200] A Memorial and Biographical History of Navarro, Henderson, Anderson, Limestone, Freestone and Leon Counties, Texas (Chicago, Ill.: Lewis Pub. Co., 1893), p. 586 (naming William Sessions as his father). [S938] A Memorial and Biographical History of Ellis County, Texas, above, p. 287 (naming Margaret Poitevent as his mother). [S1200] A Memorial and Biographical History of Navarro . . . and Leon Counties, Texas, above, p. 586 (naming Margaret Portevent as his mother). [S1200] A Memorial and Biographical History of Navarro . . . and Leon Counties, Texas, above, p. 585 (stating that he was born in 1817 in Sampson County, North Carolina). [S440] Navarro County Cemetery Records, vol. 4 (Corsicana, Tex. : The Navarro County Gen. Soc'y, 1985), p. 86 (giving the date but not the place). [S938] A Memorial and Biographical History of Ellis County, Texas, above, p. 287 (stating that he was born on 7 Jan 1817 in Alabama). [S938] A Memorial and Biographical History of Ellis County, Texas, above, p. 287 (giving her name as Miss Emily Surplins and stating that they married in Mississippi without giving the date or county). [S938] A Memorial and Biographical History of Ellis County, Texas, above, p. 287 (identifying her as Mrs. Gordon). [S1014] Wayne Rousseau, electronic mail to Roger Bartlett, 20 Dec 2004, (giving her name as Permilia Spurlin Gordon). [S402] Obituary of Rachel Hammonds Sessions, online http://www.rootsweb.com/~txnavarr/Obits/obituary.htm, viewed on 20 Mar 1998. [S938] A Memorial and Biographical History of Ellis County, Texas, above, p. 287. [S440] Navarro County Cemetery Records, vol. 4, above, p. 86. [S474] Memorial and Biographical History of Navarro County (n.p. : n.pub., n.d.) P. 106. [S1200] A Memorial and Biographical History of Navarro . . . and Leon Counties, Texas, above, p. 585-586. [S938] A Memorial and Biographical History of Ellis County, Texas, above, p. 287 (naming Isaac B. Sessions as his father). [S1200] A Memorial and Biographical History of Navarro . . . and Leon Counties, Texas, above, p. 585 (naming Isaac B. Sessions as his father). [S938] A Memorial and Biographical History of Ellis County, Texas, above, p. 287 (naming Isaac B. Sessions as her father). [S1200] A Memorial and Biographical History of Navarro . . . and Leon Counties, Texas, above, p. 534 (naming I. B. Sessions as her father). [S938] A Memorial and Biographical History of Ellis County, Texas, above, p. 287 (giving her name as Maud and naming Isaac Boone Sessions as her father). [S961] Find A Grave, online at http://www.findagrave.com, memorial for Maud Sessions Gatewood, memorial no. 49033417, viewed on 25 Jun 2014 (naming Isaac B. Sessions as her father). [S197] Nancy Timmons Samuels & Barbara Roach Knox, comps., Old Northwest Texas: Historical-Statistical-Biographical, vol. 1-B, Navarro County, 1846-1860 (Ft. Worth, Tex. : Ft. Worth Gen. Soc'y, 1980), p. 510 (naming Isaac Boone Sessions as her father). [S399] Obituary of Laura Sessions McGee, online at http://tinyurl.com/LauraMcGee, viewed on 19 Jul 2011, (naming Isaac Boone Sessions as her father). [S938] A Memorial and Biographical History of Ellis County, Texas, above, p. 287 (naming Isaac Boone Sessions as her father). [S961] Find A Grave, online, above, memorial for Roxana M. Sessions Lackey, memorial no. 10367404, viewed on 24 Dec 2013 (naming Isaac B. Sessions as her father). [S938] A Memorial and Biographical History of Ellis County, Texas, above, p. 287 (giving his name as C. M. Sessions and naming Isaac B. Sessions as his father).